Climens is poured alongside a selection of cheeses. Lurton-Thomas, owner of esteemed Bordeaux First-Growth Château Climens, thinks cheese lovers will be surprised to discover how well their favorite fromages pair with her sweet Sauternes wines. Sauternes, the famed—and expensive—sweet wines of Bordeaux, traditionally have been consumed with dessert or on their own. To prove her point, the owner of the so-called “Lord of Barsac,” as the chateau is known, hosted a recent media tasting at the tiny French Cheese Board shop in New York City’s NoLita neighborhood. There, she and the participants sampled eight French cheeses with four Climens wines. 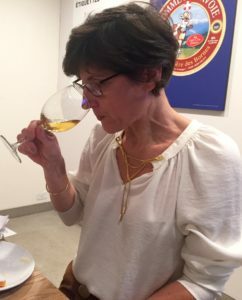 Lurton-Thomas, who has overseen Climens in the tiny Sauternes appellation Barsac for the past 25 years, said such pairings are not uncommon in France, though most aficionados would first think of dry red wine and cheese. “With most cheeses, I think white wineries better,” she said. Her sweet white wines, have plenty of acidity, which keeps them from feeling thick and cloying and helps them to stand up to the acidity in cheese. 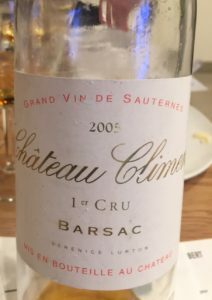 Climens, which since 2010 has utilized biodynamic farming, makes its Sauternes with 100 percent Semillion grapes that have been infected by the botrytis fungus, also called “Noble Rot.” Other Sauternes producers also use Sauvignon Blanc. The botrytis causes the grapes to shrivel, thereby concentrating the sugars and intensifying the aromatics. Bleu d’Auvergne is a creamycow’s milk blue cheese from the Auvergne region of south-central France. A strong-smelling cheese, its taste is spicy, grassy, floral. Époisses de Bourgogne, well known as stinky cheese, it’s made in and around the village of Époisses in Côte-d’Or. Some consider pungent Époisses to be the smelliest cheese in the world (think sweaty, smelly socks). Even so, this creamy cheese has a salty and powerful rich flavor. Extra-aged Mimolette, a dense, hard cheese produced near Lille, it’s similar to Dutch Edam though with distinct orange color and nutty flavor from the addition of annatto. Extra aging produces hazelnut-like flavor. Ossau-Iraty, a sheep’s milk cheese from the French Pyrenées. The texture is uniformly smooth and dense, but supple. Flavors are sweet and nutty, with pleasant earthy notes from the cheeses made during the winter and grassy, floral, vegetal flavors from the summer cheeses. Fourme D’Ambert is made from pasteurized cow’s milk in Auvergne with less spicy blue mold than its cousin, Roquefort. Velvety and creamy with earthy mushroom overtones. Petit Sapin (literally, little fir tree) is a washed rind, pasteurized cow’s milk cheese, from the Alpine Comte region of France bordering Switzerland. It is smooth, creamy with a sweet creamy aftertaste. Vacherin Mont D’Or is a soft, rich, velvety, buttery seasonal cow’s milk cheese that has been wrapped in spruce. Made near the mountain D’Or on the border of Switzerland only between Aug. 15 and March 15. Sainte-Nectaire (meaning sweet nectar) has a fruity aroma, rich texture, creamy texture, and a sweet flavor. It has been produced in the volcanic, mineral-rich meadows of the Monts-Dore region of northern Auvergne for centuries. The resulting milk from the Salers cows has high concentrations of phosphorus, potassium, and magnesium. The blockbuster 2005 Climens–all gone. Les Cyprès de Climens 2012 (average price $64 according to wine-searcher.com). From a challenging vintage in which some Sauternes produces made no grand vin, Clemens produced both a grand vin and with grapes left after the primary selection it produced Les Cyprès, its second label. Nonetheless delicious, floral and honeyed, but less viscous than the grand vin bottlings. Château Climens 2009 (average price $127). A very good vintage that produced wines with ripe, powerful botrytis character, rich texture with freshness and balance. Amber-hued, it offered layers of flavors including minerals, flowers, citrus and stone fruit notes, but terrific balanced of sweetness and acidity. Château Climens 2007 (average price $160). A terrible vintage for Bordeaux, 2007 was one of the greatest Sauternes vintages, largely due to great autumn weather. Candied fruits on the nose, great acidity, sweet and viscous without being cloying with a lengthy finish. Château Climens 2005 (average price $119). Called a “big one” by Lurton-Thomas, this was a classic, powerful, elegant Sauternes. The product of a hot, drought year. There is apricot on the nose; on the palate, orange marmalade, apricot, and honey, with good acidity and a finish that doesn’t quit. Why are these Bordeaux wines different from all other classified growths? David Lincoln Ross on A chocolate beer instead of Easter eggs?